This painting had been held in my spirit for 2 years “waiting” for the call to paint it. After the second time in front of the Eastern Gate in Jerusalem, Israel, this time blowing the shofar, I was released to paint it. Hamtan melek or meleck mechake or melek ha kadosh….all Hebrew words to say essentially, THE HOLY KING WAITS. Many see visions of Yeshua ha machiach waiting at the Eastern Gate hearing the cries of His people yearning for His coming to rule from the temple mount. I show Him here as the Lion of Judah with full prismatic mane. He is glorious! Our God sees past, present and future without time distinctions. He sees the end in the beginning because He is in all. So, waiting for God is so different than it is for us who are bound by those separations. We agonize and often have much anxiety over waiting for something we are longing for; we might be afraid it won’t happen. Not so with God. He is totally capable of fulfilling His promises. When He deems it to be the fullness of time He has the power to bring final resolve and display His splendor to all. If the question, “How long?” moves away from God, despair, disappointment in God, bitterness and resistance comes pervading one’s life; If, however, we accept help from heaven to press in to God even more than before through the “How long?”question, we become susceptible to God’s wisdom and His agenda. Imaged just above the wall with just the top of the shoulders and neck and lower jaw one can see two angelic watchmen on the wall, there to help the question ”How long?” to be directed to the right source. Psalm 24:9-10 “Lift up your heads, you gates! Lift them up, everlasting doors, so that the glorious king can enter! Who is this glorious king? 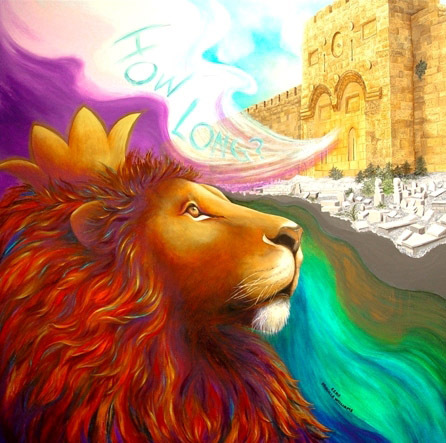 Adonai-Tzvaot, the Lord Almighty, the Lord of Hosts. He is the glorious king. Revelation 22:1 ….the river of the water of life…..flowing from the throne of God……..
Psalm 46: 4 There is a river whose streams make glad the city of God. The graveyard vs. the river of life………..we have a choice. There is a path between the river of life and the graveyard, a dark one at that. I asked the Lord about that path (many do not see the dark gray as a path). It is my impression that it is the path upon which those who are choosing to walk away from the King are walking. It would only be one step into the river of life. The choice is offered all along that path. The king watches over our choices with passionate, patient, long-suffering desire for us. In His way He waits at the gate of choice for us. He waits for the fullness of time in human history for His big picture agenda to unfold. We can only wait with His lovely characteristics if it is Him who is waiting through us. He alone has the ability to wait with such glorious regality. When we are called to wait for God to do something in our lives or in the lives of those we love, we are invited to look at how relatively short our wait is compared to His. We are invited into His perspective and His restful confidence that He can “make all things work for the good for those who love Him and are called according to His purpose.” (Romans 8:28)…..otherwise, our impatience torments us. Again, it is our choice.